Next weekend Mr B and I will be putting up our Christmas tree. Last year we went without a topper for it as we I couldn't find anything that I liked. So this year I decided to make a fairy for the top of the tree. Or at least that was the original plan, now she'll be more of a Parisienne gown wearing model! ...on Etsy. Vintage Barbie in Paris! Only £1.96 to download. 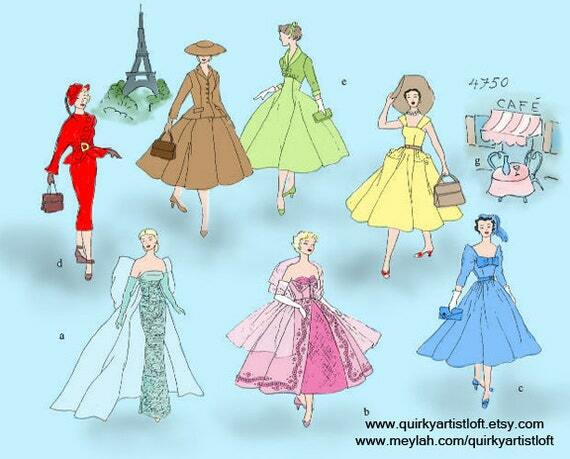 So I've decided to make View B (the pink one) a 'Dior Taffeta Ball Gown'. The instructions aren't as perfectly clear as they could be and I don't know how my doll's proportions compare to vintage Barbie's so I have made a trial version. It isn't finished at all, just pinned down the back, but its given me a good idea of how the fabric layers work. I can deal with any differences in proportions by taking the dress in at the back. I didn't transfer the pattern markings so nothing lines up at the front and my fabric was a little too thick for working on such a small scale. I'm now ready for my tree worthy version using scraps left over from other projects.